Hogmountin - "Tales From The Iron Lung"
Alabama sludge-stoners Hogmountin consist of Judd on bass and vocals, Barnes on guitar, and The Coge on drums. 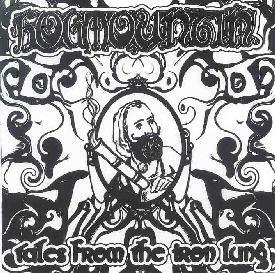 "Tales From The Iron Lung" is a CDR release with a nicely illustrated black and white cover without label or a catalog number, and is the band's rather marijuana driven debut. The opener "Onward To Hogotha" opens with noise from a bong and some caughing and a simple melody and stoned noises in the background, serving as a nice intro to the album. "High-Way" is a massive stoner piece which opens with strange B-movie samples about scoring grass. Its a thunderous track which lasts over 9 minutes and is like a sludged out Electric Wizard at first which transforms into the song sounding more like early Soundgarden on valium. "The Hermit" has an evil vibe and is one of the shorter tracks, while "Doomchild" and "Fogcutter" are tracks which last over 12 and 14 minutes, respectively. The rest of the album is generally more of the same. "Tales From The Iron Lung" perhaps owing some debt to Monster Magnet's "Tab 25" as most songs are above the 10 minute limit. Production isn't great but the overall vibe is good on this 6 track CDR album which clocks in at just under an hour of swampy and sludged out heavy stoner rock. For more information you can email Hogmountin at: hogmountin@hotmail.com.